GameDev made easy...ish. Game programming starts here. Xenko 3.1 beta has just been released. This is the first major point release since the Xenko project went open source this summer. The primary focus of this beta is reorganizing Xenko to make it play nicely with the NuGet distribution system, although this refactoring has some very cool side effects. Now you are able to use individual components of Xenko on their own. For example, if you wanted to use the Xenko graphics library on it’s own, you can, independent of the rest of the Xenko game engine. This release also moves towards Xenko using .NET standard. Xenko was always a big proponent of NuGet: since first version, Xenko was distributed as a NuGet package. However, due to limitations (hello packages.config and project.json! 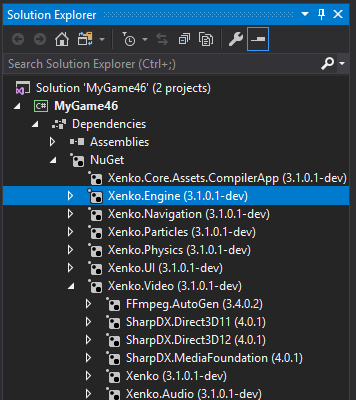 ), we were leveraging NuGet more as a distribution medium than proper NuGet packages: Xenko 3.0 is still a monolithic single package and it would not work out of the box when referenced from Visual Studio without using Xenko Launcher and Game Studio. Xenko 3.0 paved the way by making Xenko compatible with the new project system (game projects were referencing Xenko using a PackageReference). Xenko.Core.Mathematics or Xenko.Graphics: yes, if you want to make a custom project only using Xenko mathematics or graphics API without the full Xenko engine, you can! Xenko.Core.Assets, Xenko.Presentation or Xenko.Quantum: all those piece of tech being used to build Xenko tooling are also available for reuse in other projects. Nothing prevents you from generating assets on the fly too! If you don’t reference those packages, they won’t be packaged with your game either. In many situations, it results in a smaller packaged game and improved startup time. In addition to the above changes, you can take a look at the commit log on GitHub for other aspects that made it into the 3.1 release. Today saw the release of version 3.0 of the Xenko game engine. The Xenko game engine was made by Silicon Studios in Japan, previously known as the Paradox 3D engine. It was obviously having some issues as a product, with a few announced changes to the licensing structure and then in March rumours that it would be open sourced. Today that exact thing happened, Xenko 3.0 was released under the MIT license and is now available on GitHub. As part of this release, Silicon Studios are no longer going to be supporting Xenko development. Fortunately though, this is not the end for Xenko, as one of the engine developers is currently going to be supporting the engine full time, at least in the short term. He has started a Patreon account in an attempt to raise the funding required to continue supporting the game engine going forward. You read that right. Xenko 3.0 is out now, released under the permissive MIT license. From now on, you can use and modify Xenko completely free — whether you’re a professional, a student, or just looking for a new hobby. This includes both the runtime and editor. Main focus for this release was on the open-source transition, but Xenko 3.0 also includes some new features, such as a switch to the new C# project system, video, hair and skin rendering. Read the full release notes here. Silicon Studio no longer supports Xenko, but members of the Xenko team will continue to work on it independently as part of the community. More specifically, I will personally work on it fulltime for the next few months to see if it picks up some steam as a community project. Kudos to Silicon Studio for starting and supporting the project so far! Turning the project open-source and community-driven is a fantastic achievement. While the majority of the 3.0 release was targeting at moving to open source, there were a few additional features including video playback support and hair rendering. Additionally the SiliconStudio namespaces were removed, so if you are an existing Xenko developer, you will have to do some refactoring. If you are interested in learning more about the Xenko game engine, be sure to check out our Closer Look review, as well as our much older Tutorial Series. You can see hands-on with the engine in this video and see what it is capable of in the 2017 demo reel. In beta for a couple of years now, Silicon Studios have just released Xenko Game Engine. If you are interested in learning more, we did a complete tutorial series back when it was known as Paradox 3D. As part of the release pricing information has finally been announced. Until July 31st, the Pro version will be available for free. Xenko is a cross platform 2D/3D game engine with an editor and full Visual Studio integration. The primary language is C#. The personal release requires a splashscreen and has a $200K USD revenue limit. We did a hands on video detailing the new release below and embedded below. Xenko Game Engine, previously known as Paradox 3D, just released version 1.9 and frankly it’s a rather impressive update. We reviewed the Xenko game engine in the Closer Look series, including a brief tutorial series should you wish to learn more. Xenko is a (currently) free, C# powered full featured cross platform game engine with a comprehensive editor. This release brings dozens of minor improvements as well as a handful of rather major ones including an integrated code editor, a switch to standard .NET projects instead of the somewhat awkward PCL format, vastly improved copy and paste, new starter templates ( FPS, TPS and Top Down RPG ) and a new NavMesh system. From now on, new projects are created as .NET Standard projects rather than PCL projects. Mesh importing now supports ByEdge smoothing which was previously ignored. If you notice any difference with vertex normals for your models please check your FBX export settings. Prerequisites installer will ask for UAC once instead of many times, and perform a silent installation for all of the prerequisites. Previously, when an EntityComponent (i.e. script) couldn’t be loaded because game or plugin assembly didn’t compile properly, we kept a Yaml representation of it so that it could be saved or reloaded after a code fix. Now we allow it to happen anywhere, so that you can use and/or implement custom classes for any type of the engine in your game/plugin. Improve asset logs and errors to properly display failure/warning icon on all assets, including the one with icon-style thumbnails. Improve loading/refreshing of assets in the scene editor. Asset editors will display a * in the tab name when an asset is dirty. Add editor for C# source code. C# files and .csproj files are automatically reloaded as they are modified on hard drive (using a Yes, Yes to All, No, No to All dialog). Add a Save All button that saves both assets and source code files. Asset YAML serialization has been changed to handle overrides in collection in a better way. More scenario of overrides are now supported. SharpYaml has been integrated into our codebase as SiliconStudio.Core.Yaml. Most of the duplicated types have been merged back in the SiliconStudio.Core.Reflection. Assets don’t use a ~Base section nor a ~BasePart. Change Asset.Id to be of an AssetId type rather than Guid, to avoid invalid comparisons with other kind of ids. Remove the Properties member of Package. Overrides of properties is now handled using Quantum instead of ShadowObject. Remove the asset diff/merge classes. DataSerializers are now generated in a file with .pdb information, so that the user can debug them. Add Local offsets to procedural models. EntityComponent now implements IIdentifiable and has an Id property. Replace float with AngleSingle for MaxSlope of character controllers. For more detailed information as well as a list of fixes in this release be sure to check out the complete announcement post. Xenko, previously known as Paradox Engine, just released version 1.8 of their C# powered cross platform 2D/3D game engine. If you want to learn more about the Xenko game engine, I previously featured it in the Closer Look series, as well as this tutorial series. Perhaps the biggest new feature of this release is a new UI Editor. This new editor enables WYSIWYG UI editing directly in the editor and comes with several controls and gives you the ability to edit properties such as color, layout, etc. Cel shading rendering model, enable “toon”"
Added a DebugConsoleSystem to be able to print basic debug information in game. Added Utility methods FindChild and FindRoot to Entity. Game studio side: added hard limits in Compression ratio, also now it is using a slider. Added SetRange in SoundInstance to be able to set play range, it also enables seeking. Added Position property in SoundInstance to be able to know the position in time of your playing instance. Added PlayAndForget to AudioEmitterSoundController to play many instances of the same sound rapidly. Added RequestedAudioDevice in AudioSystem to allow game code to select audio devices (Windows only for now). AudioEmitterComponent now contains a dictionary of sounds that can be used from the emitter, those can be set from the Game Studio directly! Game Studio sound preview now uses the internal engine, this means that you can directly preview the compression rate! About Page accessible from Menu–>Help–>About. Particle rendering now uses the improved multithreaded pipeline, significantly speeding up the vertex buffer building. Several samples have been removed. Particles and Physics samples have been greatly reduced and merged into only two, which allows the user to check more features with a single sample. Procedural models can now be used as a source to generate convex hull shapes. We are now using the github version of Bullet Physics and actively cooperating with the project. Fixed ColliderShape cached matrices computation. Credential dialog will now save the credential settings when closing. Credential dialog will not appear if you checked “Do not ask again”. Fixed hang when launching a Linux game remotely. The UIComponent expect a UI Page in place of the previous Root Element property. Most dependency properties were changed into regular C# properties, except the ones that are attached properties (such as the Column and Row attached property of a Grid). In desktop, TouchMove event is also raised when no mouse button are pressed. Default style of the UI has been removed. Removed Play with boolean argument from SoundInstance, instead the same behavior will be achieved by using PlayExtended or Play. Collision.Contacts is now an HashSet so access by index is not possible anymore, please use foreach or iterate them instead. Added audio, status and re-center support for Oculus Rift. On Linux, when switching the underlying Graphics Platform, rendering will not occur. Delete the cache, local and roaming folder on the Linux host and restarting the game should fix the issue. Linux Mono has some issue with the new effect compiler (since 1.7.5-Beta). Please use the “remote compiler” in the “package properties” (right-click on the package in solution explorer), or use Linux CoreCLR in the meantime. Xenko is available as a free download here. All rights reserved. Copyright 2018 GameFromScratch.com.